Important Note: This article is about exporting forms in CSV format, which allows access to the raw data in the forms. To learn about exporting forms as PDF files, read the article on downloading and printing forms. GoFormz can export your form data** to the standard comma-separated values (CSV) format. These files can then be opened with Microsoft Excel or other spreadsheet and data analysis software, where you can manipulate and analyze the data. 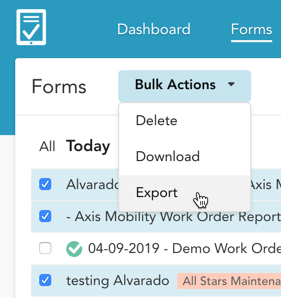 In the Forms Tab, select the checkboxes next to the forms you want to export. A Bulk Actions menu will appear at the top. Expand this menu, and click Export. This will generate a single CSV file containing data from all your selected forms. Each row in the exported CSV represents a form, with the exception of the first row which contains column headings. So if you export a single form, the CSV will have 2 rows, if you export 5 forms it will have 6 rows, etc. TemplateId: The unique 32-digit hexadecimal identifier associated with the form template from which this form was created. FormId: The unique 32-digit hexadecimal identifier associated with the form. FormName: The name of the form. CompletedDate: The date and time when the form was completed. If the form was completed and reopened multiple times, this will be the time of the first completion. If the form has never been completed, this will be blank. LastUpdatedDate: The date and time when the form was last modified in any way. **Note: that only text-based form fields are exported. The following field types will not be exported: Table, Image, Location, Signature, and Sketch. Shared fields also will not be exported, with the exception of the five mentioned above (TemplateId, FormId, FormName, CompletedDate, LastUpdatedDate).